Recently I found myself in a seminar with old friends and colleagues at the London School of Economics. They are one of the best teams of economists and social scientists you can find working on problems of social policy anywhere in the world, most of them with experience of advising governments and senior politicians – usually Labour governments and politicians. As our discussion finally dissolved into informal chat I found myself surrounded by professors asking me how the Scots will vote in their referendum on independence, and how I shall vote. It was an expert interrogation conducted by people well aware that their chances of getting a Westminster government that is concerned about the kinds of questions they care about depend heavily on Scottish votes. They asked me about many of the dilemmas we have been pondering in Scotland in the aftermath of our white paper – and most of them could not understand why any intelligent Scot would be voting for independence. It was an afternoon that compelled me to clarify my own thinking. What matters most, I said, is not how an independent Scotland will fare. Independence will of course bring teething troubles of many kinds; but the Scots, if they choose to break away, will make their way in the world pretty successfully. What matters most, I said, is what you are doing in England; what kind of country you want to make of the UK; and whether we in Scotland want to be part of it. The most important question facing Scotland – independent or not – is whether we can enable people living in the central belt and around the Clyde, where the UK’s greatest concentrations of poverty are to be found, to enter our society’s mainstream and gain the opportunities every human being should have. ‘Is Glasgow to belong to Scotland or not?’ is a crude way of posing this question. I used to think we’d stand a better chance of getting the right answer to it if we remain in the UK with the resources of the whole island to help us. Now I am not sure that the rest of the UK – even the relics of its Labour movement – have much interest in that question. This analysis is followed by chapters written by leading politicians and commentators of the left laying out the policy proposals that polls and focus groups suggest will win these votes for Labour. Policies for the economy, immigration, education, housing and the NHS, for example. But not much about poverty, social security, inequality or social justice – the traditional concerns of radicals – and nothing about Scotland. Most of us could give examples of policy statements by leading Labour politicians that tell the same story. Professor John Curtice of Strathclyde University – the UK’s principal analyst of political polls – tells us that average Scottish voters are no more egalitarian or progressive than their English counterparts. But a political culture runs deeper than average voters’ responses to the simple questions posed in a mass survey. If you listen to politicians, their civil service advisors and political journalists in the two countries, or just to their more serious radio programmes, different political cultures emerge. The Scottish ‘political class’ assume that proposals for new policies should help to create a fairer and more equal society where there will be greater social justice. They assume that proposals for solving social problems should be prepared in active consultation with the kinds of people who experience these problems. Of course they do not always live up to these aspirations; but our political class assume that they will be generally accepted by Scottish governments, whoever wins our next elections. They are not contentious. None of that can be said of England. I could give various examples of the impact of these divergent cultures, but one will have to do. When our first minister was taking questions at the press conference launching the independence white paper, a correspondent from the Daily Telegraph said (roughly speaking – I took no note): ‘Your plans for Scotland’s future are splendid. But in a country with high rates of unemployment and high proportions of pensioners, how can you pay for all this?’ To which Salmond replied: ‘That would indeed be difficult if nothing changes. But an independent Scotland will attract more young workers’. To which the Telegraph man – thinking he had a killer question – said: ‘You mean more immigrants?’. ‘Yes,’ said Salmond. ‘They make an important and creative contribution to our society and we need more of them.’ Could any serious English politician have said this? And if it had been said, would it have passed unnoticed, as it did in Scotland? We shall all have to make our best guesses at England’s political trends when the referendum comes – eight months before the next Westminster election which may give us a few pointers. But if staying in the UK seems likely to mean living in a country that leaves the European Union (Miliband, if he wins the election, has not yet promised a referendum on that, but neither has he refused one); if it is to be a country that continues to impose increasingly punitive and humiliating sanctions on its poorest citizens who live on social security benefits (Labour spokespersons on this subject seem determined to show they will match the Tories’ brutalities); if the Human Rights Act is to be repealed (as our present home secretary promises); if the UK continues to have the most centralised government in the Western world (strangling local governments and killing off civic leadership); if ‘green’ policies are to have low priority; and if our armed forces are to remain mercenary outriders to American foreign policy; then I would rather get out, whatever the hazards of independence. It’s a white paper, agreed by the main political parties, on the future plans and priorities, not of Scotland but of the rest of the UK, that I need. I guess I’ll have to place my bet without waiting for that. Looking further ahead, we have to recognise that a vote for independence – or even a narrow rejection of it – will pose difficult questions for people living in Northern Ireland, Wales, and even the north of England. If the Scots negotiate the reasonably generous settlement that Salmond expects to achieve, there will be others hoping to follow in our footsteps. The referendum is unlikely to be the end of this story. It may lead us into the end-game of the United Kingdom. David Donnison is a professor emeritus in urban studies at Glasgow University. His books include ‘The Politics of Poverty’ and ‘Speaking to Power’. This article was first published in Scottish Review, and reproduced by kind permission from Kenneth Roy. I agree that LSE represent one of the best teams of economists & social policy folk working anywhere in the world. Their work is high quality. Which is why I am but curious as to why the author claims that they think the chances of getting a progressive government in Uk is “heavily dependent” on Scottish votes. It isn’t. In only 2 of the last 67 years has it made a difference. One presumes that these colleagues were not political scientists. You’re right Andy – where do these misconceptions come from – Wings over Scotland put this one to bed a long time ago – Scottish votes boosting Labour’s presence in Westminster just does not happen to be a pivotal element. We can send 100% Labour MPs to Westminster, but it’s swamped by what is returned by England and that’s looking likely to be Tory and UKIP in 2015. Also, got to smile at the ‘Professor John Curtice of Strathclyde University – the UK’s principal analyst of political polls ‘ comment – I’d guess there would be a fairly robust objection to that from the people who follow this scene a bit more closely. There lies the total misconception. What matters most is what we do here, and what affect it can have. We must define ourselves by what we can aspire to , not be defined by a negative view of what is happening elsewhere no matter how much it influences us. We can do better regardless of how our neighbours fare. Let’s judge our progress against our own potential, not some competitive measure that is part of he problem. It’s about making our own grown up decisions. I disagree Angus, the UK should be fighting to keep Scotland as part of the UK but Cameron refuses to give us a reason to stay. I’m for independence because of the No campaign, they aren’t giving us good enough reasons to remain in the union. I would like to know how that conversation went and whether they left with the same opinion. Did they think intelligent Scots wouldn’t vote Yes for economic reasons (Scotland doing badly economically), or did they see it as a pooling resources across UK and an economy of scale thing that they thought would better help with more progressive social policy? I like the answer the author (David Donnison) gave but I am curious (as I and I am sure a lot of others are having these conversations with interested people from rUK that sometimes seem to express quite a lot of bewilderment as to the reasons we would want independence). 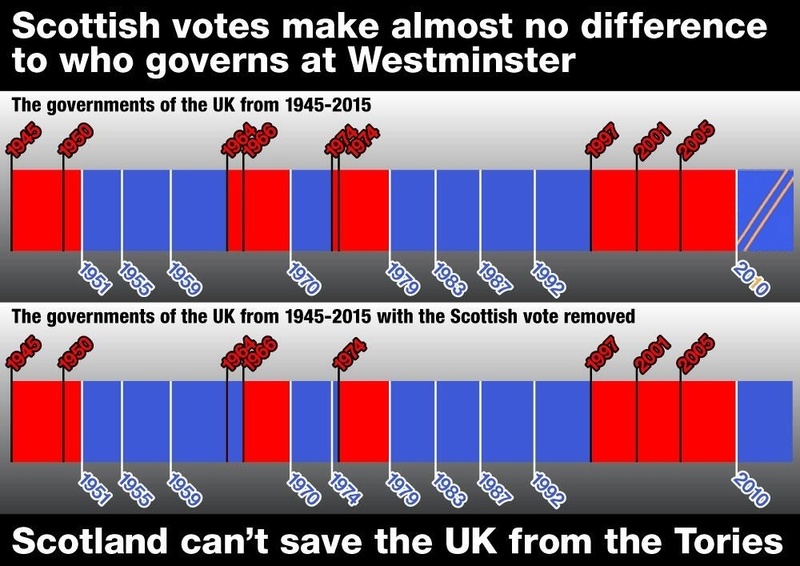 Well, considering that all but 2 of the last 50 years Scottish votes have made no difference to the government in westminster (http://wingsoverscotland.com/wp-content/uploads/2012/01/samaritans1.jpg), I’d say that your friends are empirically wrong. Leaving aside the hyperbole as to the quality of “one of the best teams of economists” (although based on its record a whole screed could be written to demolish that argument) the mere fact that it is the LONDON School of Economics tells you immediately that they will be wildly biased against ANY ideas that emanate from elsewhere. The people there see London as the centre of the Universe and so anyone who doesn’t agree with their partisan view of the world must by definition be unintelligent. Compounding the shallowness of their views is the fact that none of them are likely to know much about Scotland apart from what they read in the English Press or in WM and Labour Party hand outs. Since these never contain anything about Scotland unless it is bad, so their views about Scotland are not worthy of discussion. Are you the author or a Bella editor? You say by ‘my logic’ that: “Edinburgh University should be a hotbed of rebellious seditious republicanism…” Please explain where that ridiculous assertion can be inferred from my post? I didn’t use logic in my post I merely asserted my opinion that LSE is not the ‘grand’ institution that the Author and some others here think it is. And that can be inferred from the fact that they don’t think any intelligent Scot would vote for Independence. What a shallow point of view. Have they done any research to back up that view? Have they even discussed Scottish Independence in any detail at their forums? Surely such an institution should have been very interested bearing in mind the effect Independence could have on the Labour Party. LSE might have been the centre of the radical uprising of 1968, 46 YEARS AGO!? But it is now just another London based institution recycling tired old socialist cliches together with the establishment line that London knows best in all things. ‘It’s the economy, stupid’. No it’s not ,we are not going to the polls to decide who should run the Parliament for the next five years; we are going to decide whether Scotland should be in control of its future for the next 300 years. Fine speechcraft, but really? 300 years? If you can predict with any accuracy what the world will look like in 50 years I’ll be amazed. …and yet the UK’s economy can hardly be said to be ‘working’. As it plunges ever lower in league tables, the evidence suggests Scotland’s would be distinctly more successful. If the academics at LSE are ignorant of the basic fact that Labour needs English votes to rule, cannot really survive if the majority depends on Scottish votes, what is the the value of their opinion on anything else? David Donnison would appear to be a former Labour Party supporter, and it is precisely disenchanted Labour Party voters that we need to vote YES to win. So it´s good to see an article which goes into the thinking behind the switch from seeing the British Labour Party as part of the solution to an integral part of the problem. When I say The British Labour Party, I suppose I really mean the Parliamentary Labour Party, the careerist politicians, slick spin doctors, the policy review experts in the shadows – the Fabian Society is one place they are to be found when they’re not blogging on the New Statesman – rather than most Labour Party voters. The fact is, most Labour Party voters in Scotland these days have more in common with the broad goals of the independence movement than they do with The Labour Party, and many of them are aware of it. James Wilson’s words from 1820 have never been more fitting to describe the choice ahead of Scottish voters later this year: Scotland Free or a Desert. rUK or indeed the current UK does not and only very rarely has, depended on Scottish votes to deliver anything, least of all socially progressive governance in Westminster. Only the people of the largest concentration of electorate can deliver that and the only way this will be possible is if they have the party and the policies worth voting for. Right now the people of England, in particular, have bought into the neoliberal dream of me, myself and I. The three main parties are almost indistinguishable on policy never mind ethics and you couldn’t put a fag paper between the leaderships on grasp of the plight of the everyday man and woman in the street. We simply don’t have the electoral numbers or clout to make a difference in this one sided partnership. Even when Scots did achieve prominence of recent times, look at the outcomes. They pandered to a vote and a system they couldn’t possibly hope to overcome or change. I’m sure at some stage in their idealistic youth, they probably felt change from the inside was the way to go, they failed and in fact became one with the system. They became its biggest cheer section in point of fact and many a young idealist became a fully paid up member of the ermine club. Our political/parliamentary cultures are incompatible as is our aspirations for our people. Time to let go and work toward the governance we want, need and deserve. Scotland has never “mattered”. Few are the English who know anything about our history or our diverse culture. Even fewer are those who might from anthropological curiosity condescend to study us or have anything positive to say on our behalf. As far as Scotland is concerned the Daily Mail has us well sussed. In practice, except for liberally providing cannon-fodder for Unionist imperialist wars we have always been marginal. Of course, “we” have had different notions, imagining ourselves as equal partners in a great global adventure bringing civilisation, out of the barrel of a gun, to the benighted. We fell for the con big time. England, especially London, got richer and more populous (and still does) we, on the other hand, emigrated or clustered in insalubrious numbers in squalid and polluted cities nursing our social and industrial diseases and internalised our unfocussed resentment All in the glorious name of empire and union: the pathetic shame of it all. 300 years of voluntary subordination and still the majority, it seems, prefer it that way. Revolutions have started for much less. By the way has anyone noticed the similarities between Ukania and Austria-Hungary, satirized as Kakania, of hundred years ago? Barring the latter’s admirable creative and intellectual exuberance, the shear existential pointlessness of the British thing is identical. “By the way has anyone noticed the similarities between Ukania and Austria-Hungary, satirized as Kakania, of hundred years ago?” Mmm, good point. A society encrusted with right royal Collatoral Campaigns organised by men without qualities. As Robert Musil did for the K&K dual monarchy, perhaps we are awaiting our present-day satirist. In a certain way we are a Hungary. Hungary brought colour and ethnic exuberance rather like the romantic trappings associated with hackneyed tourist images of Scotland. True we do await our version of Musil or Heinrich Mann to engage with our own fin de régime. The fetid waft of the felicitous phonic combination K und K we cannot match but the coining Ukania (Tom Nairn?) does capture the Geist. I thoroughly enjoyed this article but like most above I’m astounded at the laziness of thought which evinces that Labour need Scottish seats to win power in Westminster. Though I will give that where the vote is tight, return of Labour MPs from Scotland does matter to the end result. What really irritates though is the selfishness of the position of these ‘socialist’ Labourites. That Scotland’s interests should be sacrificed or subsumed simply to help keep the British Labour Party in power. Under the guise of we’re all in it together. It’s entirely evident that Scotland only matters to Labour and to Westminster when Scotland threatens to leave. Delighted to see a level of debate that rises above the doom-and-gloom gutter that Better Together and its Westminster apologists keep trying to drag the debate on the most important decision of our lives. Does this mean, “We need the votes of these Scottish thickos to keep a Labour Government in power”? I think that one of the things that will happen in an independent Scotland is that because the decisions will have been brought closer to the people, and there will be a more obvious connection between taxes paid and spending made – because it won’t be circulated via Westminster – then people will actually start to get more critical of spending on things like benefits, similar to the what we are seeing in England at the moment. Similarly, it’s easy for Scottish politicians to be in favour of immigration now because Scotland has a low rate of immigration compared to England. If immigration does actual increase, I think we’ll also (sadly) start to see a rise in anti-immigration rhetoric. Political attitudes are shaped by the political eco-system; change the eco-system – as independence will – and attitudes will also change. Scotland has an ageing population and a low replacement rate. Unless the latter changes fresh and younger “blood” in the form of immigrants, new Scots in fact, will be needed for decades to come. A more vibrant and cosmopolitan country would be no bad thing. I completely agree – I’m absolutely in favour of more immigration in Scotland, and indeed in the rest of the UK and Europe. My point is that it might be erroneous to assume that currently expressed political attitudes will survive into the independence era unchanged. I find it hard to believe that as the constitutional and political landscape changes that there will be no changes in the political culture as well. It may be that attitudes will shift to the left but personally I find that unconvincing. People in England are critical of benefits and immigration because the government and media of England have embarked upon an insidious campaign to turn the public against the most vulnerable in society as a scapegoat for the true causes of austerity. Money lost due to benefit & immigration costs, legitimate and otherwise, are but a drop in the ocean compared to spending on a runaway military budget and tax dodging multinational companies. What is in play in the article is a London centric view of Scotland ie they assume we are all stupid. That of course WOULD be true if we voted to remain in Union. I trust Scots are not stupid and at the end of the day, swithering above the voting boxes, they will say yes. Westminster suspects that could happen, so they are spending a fortune, with a large army of all kinds ferreting away in files to pick out anything they can find that is suitable to twist against us. They rely on the “Scottish Cringe”, long inflicted by Westminster to save the day for them. With all the help of the English owned “Scottish” newspapers AND the English owned TV, BBC and ITV, inc STV. They, who treat us like dirt and always have done, only value us if there is a war to fight ( and there usually is!) and to drain us of all assets, which they need for the pound to retain any value and to help pay the debts that they have incurred. This time around I do believe they will find that, when push comes to shove, Scots are not so stupid after all. Whether or not I agree wholeheartedly with the minutia, I enjoyed David Donnison’s article. With so many pedants committed to petty and pseudo intellectual jousting, it takes courage to offer an empirical take on the debate in his own academic context. I applaud him. As far as the big picture in economics goes, the problem is that the emotional husks which are created in the public school system and whom, imbued with ideas of privilege and entitlement, go on to assume their position in the ruling elite devoid of any notion of what constitutes genuine wealth. An interesting example of the sort of genuine, but naive comments being made by many left-wingers in this debate. The reason why the “friends and colleagues” at the LSE could not believe that intelligent people would vote for independence is that they are insulated from most of the snow that the SNP and their fellow-travellers are constantly putting forth, which is based upon hope and assertion, but not fact. Also, the fact that the UK is demonstrating how resilient it is economically, with the growth rate being revised upwards to 2.4% and predicted (completely believably) to overtake France to return to being Europe’s second-largest economy in the next three years (the biggest in Europe by 2030, it is also predicted) show how much there is to make of the UK from Scotland’s point-of-view. Moreover, if the people of Scotland are so in favour of immigration as Mr Donnison claims, I suggest that they spend a few months living in some of the parts of England that are occupied by large numbers of non-English-speaking immigrants whose understanding of the society within which they live is nil. See how much they love it. Liberal values are wonderful things, especially when you put them into practice, but less so when you charge your own fellow-citizens’ children for their university education, but not the children from every other EU country. It is not liberal when Scots who oppose separation are described as “traitors” and “non-Scots”. Britain is a democracy which is even-handed enough to allow not only parties like the Scottish Nationalists to operate, but to become the “Scottish Government”. The UK is even-handed enough to set up a devolved administration in Scotland with tax-raising powers (which it does not use). It protects Scotland, along with all the rest of the United Kingdom as it has done for over 300 years. It offers Scots a completely equal opportunity to lead in every field – be it business (like Fred Goodwin); the professions; Government; the arts; sport – without let or hindrance. Most people in other, small, ineffectual European nations, such as Scotland would become, would give their eye-teeth to have the opportunities that Mr Salmond and his gullible followers wish to spurn. If there is a Yes vote, the laughter throughout the world at Scotland will echo about as long as that of the Big Bang. Bella Caledonia, please can we have a Cringe of the Month competition? That is one of the best I’ve ever read!